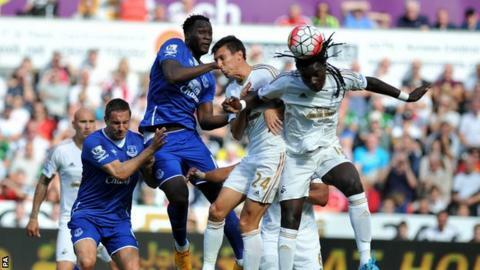 Swansea and Everton emerged with a point apiece from a goalless draw at the Liberty Stadium. Everton had the better of a dull first half, although Swansea's Bafitimbi Gomis came closest to scoring when skewing wide of Tim Howard's goal. Both teams improved after the break but Everton striker Romelu Lukaku twice shot over the bar when through on goal. The dismissal came too late to help Swansea, who had defended well to repel numerous Everton attacks in the final quarter of the game. Neil Taylor made an excellent last-ditch challenge to block a Lukaku shot while Ashley Williams deflected a Brendan Galloway shot over with his head. John Stones, excellent in the Everton defence throughout, swept up Swansea's counter-attacking play, while Howard was called upon to parry a fierce Gomis shot. With the game winding down and both teams seemingly having given up on the idea of finding a late winner, Belgian Mirallas made a rash and dangerous challenge on fellow substitute Modou Barrow, going in over the top of the ball. The winger's absence will be sorely felt by Everton over their next three matches, as Roberto Martinez's side struggled to convert the chances they created. Lukaku was the most wasteful of the Toffees' players. Aside from his two wild strikes into the stands, the Belgian international twice more took too long to finish, allowing Swansea players to cover. Steven Naismith and Arouna Kone were also disappointing in the Everton attack but Ross Barkley was bright in midfield, making several incisive runs and passes. The home side were wasteful in attack too, but they did at least manage to have more shots on target - three to Everton's two. Gomis looked the most likely of Garry Monk's players to score, but their biggest problem was finding a way around the Everton defence. Stones was again composed throughout and the England centre-back repeatedly made key interventions to steer his side away from danger. Everton right-back Ty Browning kept Jefferson Montero quiet on what was the 21-year-old's first Premier League start, and that will be another positive for Martinez. Everton have kept three successive clean sheets away from home in the Premier League for the first time since December 2013. Swansea have not won any of their five Premier League meetings with Everton at the Liberty Stadium (D2 L3), scoring just two goals in the process. Roberto Martinez has overseen two wins and three draws in his five Premier League games as Everton boss against the Swans. Kevin Mirallas is the only substitute to have been sent off so far this season. Swansea manager Garry Monk: "We had chances and they had chances, but I think both teams will be happy with a point. "I thought it was an entertaining game and a good advert for Premier League football. Both teams went for it and both teams defended well. "I felt it was a good performance. If you can't win a game, you have to make sure you don't lose it, which is what we should have done last week." Everton manager Roberto Martinez: "The first half was very level. We needed to be more aggressive going forward and that's why I'm pleased with the second half. "We created good chances and they should have won us the game. I'm disappointed, but the overall performance was satisfying. "In the second half we took control, we played through them a few times and everything started with the composure of John Stones and Phil Jagielka." Everton play at Reading in the League Cup third round on Tuesday evening before travelling to West Brom for a Monday night game in the Premier League. Swansea play at Hull in the League Cup third round on Tuesday before travelling to Southampton in the Premier League on Saturday. Match ends, Swansea City 0, Everton 0. Second Half ends, Swansea City 0, Everton 0. Attempt missed. Ki Sung-yueng (Swansea City) left footed shot from the centre of the box is too high. Assisted by Eder following a set piece situation. Kevin Mirallas (Everton) is shown the red card. Attempt missed. Jonjo Shelvey (Swansea City) left footed shot from outside the box is high and wide to the left. Assisted by Modou Barrow. Substitution, Swansea City. Modou Barrow replaces André Ayew. Attempt missed. Steven Naismith (Everton) right footed shot from the centre of the box misses to the right. Assisted by Gerard Deulofeu. André Ayew (Swansea City) is shown the yellow card for a bad foul. Delay in match Kyle Naughton (Swansea City) because of an injury. Brendan Galloway (Everton) wins a free kick in the attacking half. Foul by André Ayew (Swansea City). Offside, Swansea City. Kyle Naughton tries a through ball, but Bafétimbi Gomis is caught offside. Attempt blocked. Romelu Lukaku (Everton) left footed shot from the centre of the box is blocked. Assisted by Ross Barkley with a through ball. Tyias Browning (Everton) is shown the yellow card for a bad foul. Foul by Tyias Browning (Everton). Attempt blocked. Ross Barkley (Everton) right footed shot from outside the box is blocked. Assisted by Steven Naismith. Corner, Everton. Conceded by Ashley Williams. Attempt blocked. Brendan Galloway (Everton) left footed shot from the centre of the box is blocked. Attempt missed. James McCarthy (Everton) left footed shot from the left side of the box misses to the right. Assisted by Ross Barkley. Attempt saved. Bafétimbi Gomis (Swansea City) left footed shot from outside the box is saved in the top centre of the goal. Assisted by Kyle Naughton. Substitution, Everton. Gerard Deulofeu replaces Arouna Koné. Corner, Swansea City. Conceded by Tim Howard.